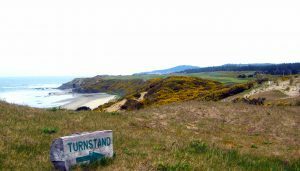 If you’re a beginning golfer looking to improve your golf game, there are several options to choose from. One is through self-assessment alone, and while that may be easier than hiring a coach, that certainly leaves room for multiple mistakes to occur and for your game to get progressively worse. Another option is to choose a coach and take private lessons. This option can be successful but also takes a great deal of money and time to happen. So what do you do if you are stuck in the middle between coaching and self-reflection? One great option is to mimic the best the PGA has to offer. 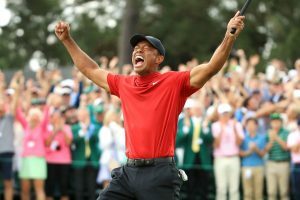 The business of elite golfers showing amateurs how to better their game through tips and lessons has always been a great place to start for the golfer who’s run out of answers. 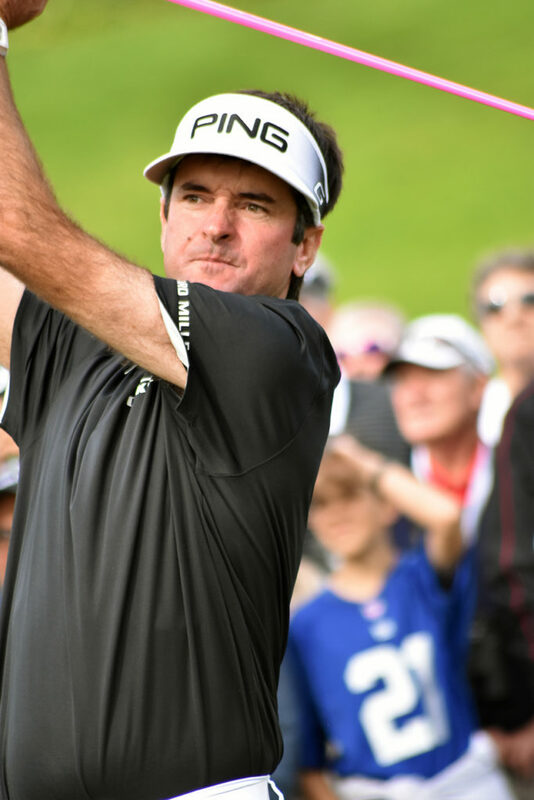 Here are several tips from the Top 20 PGA Tour golfers that should instantly improve your playing performance. The stories about how Bubba Watson never took a lesson growing up are legendary at this point. 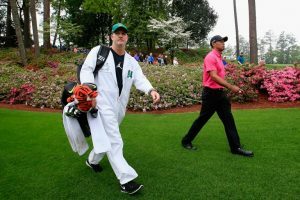 The two-time Masters winner grew up trying to challenge himself with his golf practice time. Watson intentionally found creative ways to make practice tougher. For example, he routinely hit golf balls around trees working to learn how to shape and control his shots. Watson’s tip of always practicing by looking for the most fun way to play is excellent advice for any amateur. 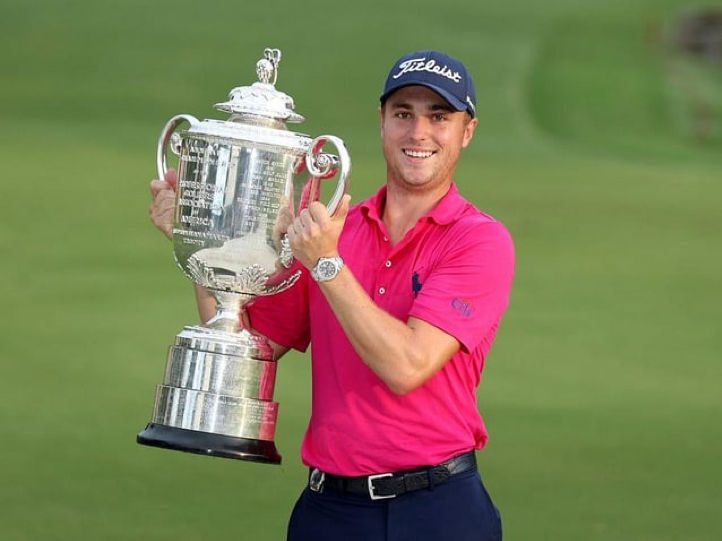 Justin Thomas is not a big man. At 145 pounds, the 2017 PGA Tour Player of the Year, needs every inch of his body to hit the 300-yard drives he blasts routinely during PGA tournaments. So what is his secret? Well, its a tip he learned from watching Tiger Woods. On the backswing, Thomas likes to get his hands high, like Tiger, to take the driver to parallel. Thomas believes that the full width of his swing generates additional power, getting the most out of his smaller frame. Thomas encourages keeping the left arm straight, and your wrists flat as the club goes back to parallel. What you always want to make an emphasis not to do with this swing tip is fold your right arm past 90-degrees. Your yardage will undoubtedly suffer. 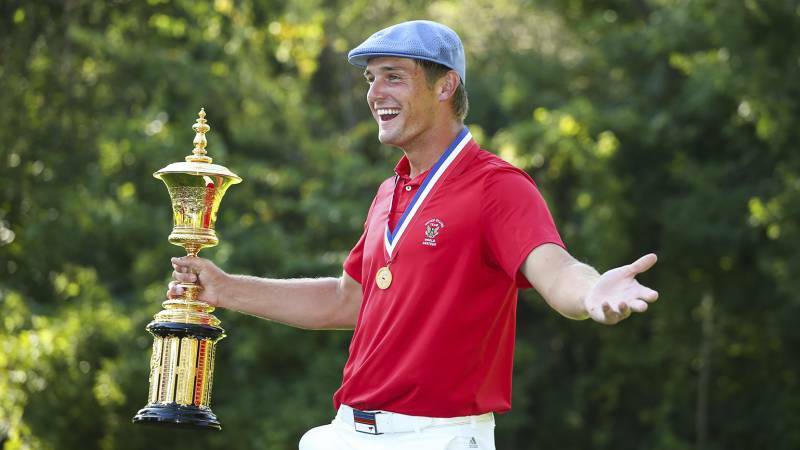 DeChambeau, a 2018 U.S. Ryder Cup member, is an adopter of the single plane method. Simply put, DeChambeau draws the club back and swings through the ball on the same plane. Most golfers drawback on one plane then shift the club to another plane on the downswing. The trick for DeChambeau in making the single plane swing work is by maximizing the rotation of his body to reduce shifting his weight. DeChambeau’s tip for good rotation is to use your head as a center point, making sure that as the body turns, the head stays in the same location. Weight doesn’t shift to the back inside leg but instead stays level over both feet. Making this change will have your swing feeling more centered and steady. 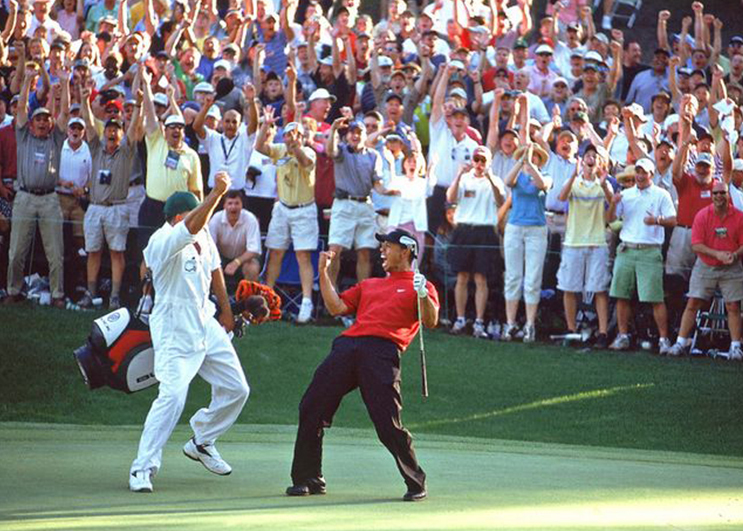 14-time major winner Tiger Woods has made his fair share of chips off the green. One of his secrets is keeping the wrists firm through impact. 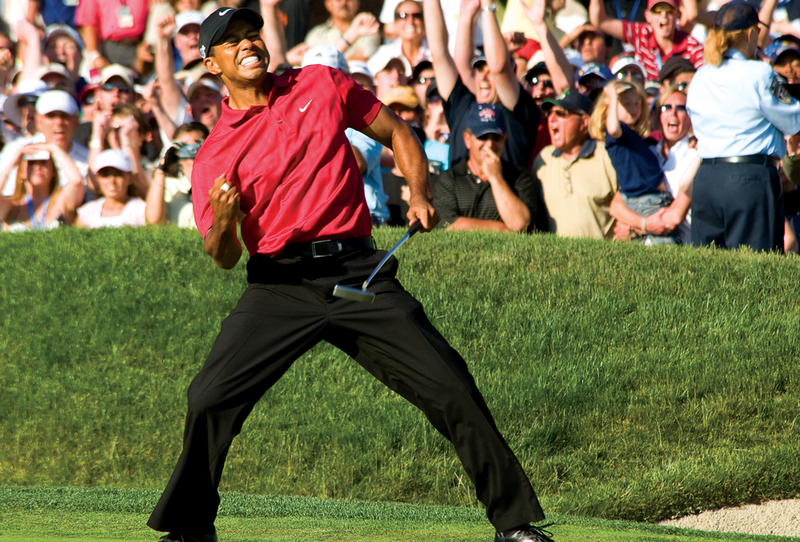 Tiger believes that amateurs try to scoop the ball in the air causing thin shots and off-center strikes. Quiet wrists don’t mean you strangle the grip of the club. Instead, keep the grip snug in your hands along with locking the wrists. You also want to eliminate a breakdown of the takeaway. Along with working on firm wrists, Tiger says using a shorter and more compact backswing is a must to better pitch shots. The problem with a long backswing is that it promotes a deceleration of the club which results in weak and ineffective chip shots. So, next time you hit the practice green, work on chipping using Tiger’s firm wrists and short backswing tip. You’ll be sliding balls close to the cup in no time. 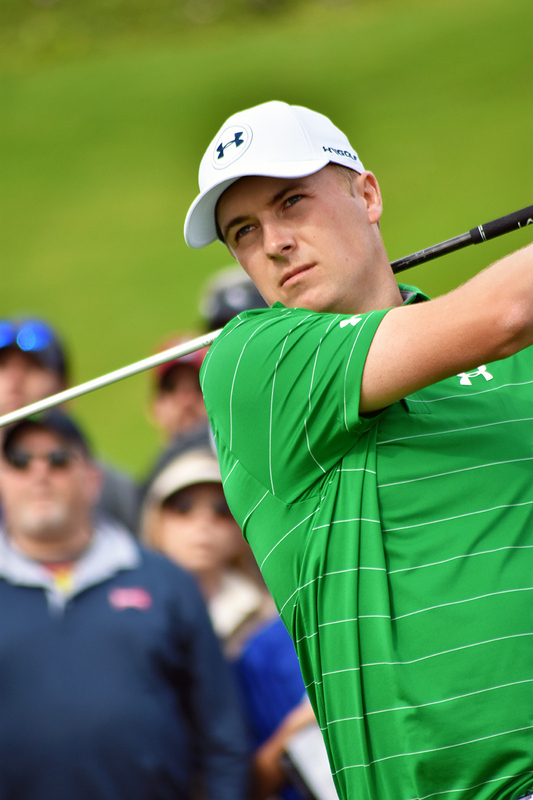 The 2015 PGA Tour Player of Year, Jordan Spieth is known to be deadly on the greens. His method for finding the bottom of the cup on putts from any range involves a secret checklist that Spieth runs through every time he strikes a putt. The first R in his three-R checklist is determining the path of the putt through reading the green. By finding the right line, Spieth gains the confidence to hit the perfect putt. Spieth starts behind the ball to see the line, then walks to the side of the putt to look for any slope. He finishes his read by going behind the cup and making one last assessment for the break of the green. The next step involves the routine before hitting the putt. Jordan addresses the ball by getting his putter online with his right hand only. As his feet get into position, he places the left hand on the club to form his standard grip — this is especially beneficial for beginners with new clubs. Spieth checks to make sure he feels balanced, and once he feels right, he pushes the putter toward the hole with a bit of forward press. Once, Spieth moves the putter forward he engages the last step which is rolling the ball. Spieth wants to accelerate through the golf ball, so the hands and lead shoulder are ahead of the golf ball. His perfect putt has a low and strong finish to make sure that the ball is consistent and on the line.